Prof. Michael C. Davis, a professor in the Law Faculty at the University of Hong Kong until 2016, remains a senior fellow in the university’s Centre for Comparative and Public Law. He was previously a professor and Director of the Graduate Program in Law and Public Affairs at Chinese University of Hong Kong. 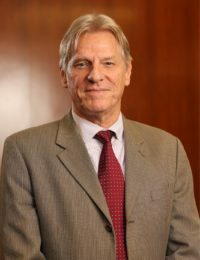 He has held the Distinguished Visiting Professorship at India’s Jindal Global University, the J. Landis Martin Visiting Chair in Human Rights at Northwestern University and the Robert and Marion Short Visiting Chair at Notre Dame University, as well as the Schell Senior Fellowship at Yale Law School. His books include Constitutional Confrontation in Hong Kong (1990), Human Rights and Chinese Values (1995), and International Intervention in the Post-Cold War World (2004). His articles have appeared in leading scholarly journals in law and politics. As a public intellectual, he has contributed commentary to such newspapers as the New York Times and the South China Morning Post, for which Amnesty International and the Hong Kong Foreign Correspondents Club awarded him the 2015 Human Rights Press Award. During his fellowship, Prof. Davis is working on a book relating resistance movements to constitutionalism for emerging democracies in Asia.